Nutrition for Special Dietary NeedsTM home study continuing education course addresses the nutritional needs and issues of, and exercise prescription guidelines for children, adolescents and older adults. It identifies the impact of nutrition and physical activity on the physiological changes with menopause and during pregnancy and lactation. It distinguishes different types of vegetarianism and explains the pros and cons of vegetarianism. It also distinguishes between overweight, obesity and healthy weight. Methods for assessing body composition, how to calculate energy needs and dietary guidelines are presented. The role of dietary supplements in weight loss, plus the role of aerobic exercise and resistance training in promoting weight loss, are addressed. The impact of nutrition and the importance of exercise and physical activity in managing Diabetes Mellitus are explained. The general principles of treating eating disorders and weight gain recommendations, along with nutrition and exercise prescription for the treatment of eating disorders are discussed. And, ways that the body can gain or lose heat in varying environments and the physiological changes that occur are described. 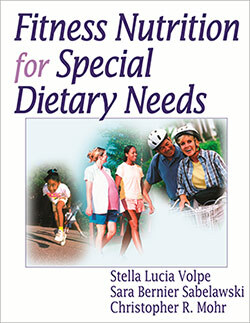 Electronic format — The Nutrition for Special Dietary Needs™ certificate package with online test includes the eBook version of the 200-page Fitness Nutrition for Special Dietary Needs by Stella Lucia Volpe, Sara Bernier Sabelawski, Christopher Mohr (accessed through Adobe Digital Editions/BlueFire Reader) and a 64-page workbook provided in PDF format. Instructions for completing the 50-question multiple-choice online test and obtaining CECs are also included in PDF format. Note: This course package is made available for immediate access and download after purchase. All materials for this electronic format course are available electronically. Nothing is mailed. Hard copy format — The Nutrition for Special Dietary Needs™ certificate package with online test includes the 200-page book Fitness Nutrition for Special Dietary Needs by Stella Lucia Volpe, Sara Bernier Sabelawski, Christopher Mohr and a 64-page workbook. Instructions for completing the 50-question multiple-choice online test and obtaining CECs are also included. Note: Course materials for this hardcopy format program are sent through USPS Priority Mail.